Services at First Unitarian Universalist Church of New Orleans, Louisiana were targeted on Sunday, July 20, 2014 by members of the anti-abortion protest group Operation Save America (OSA)– formerly known as “Operation Rescue” – for having hosted the groundbreaking celebration of a new Planned Parenthood family counseling center to be built nearby. As reported on the Rachel Maddow Show in the story, “Anti-abortion extremists violate church sanctity“, when protesters disrupted the service, UU youth spontaneously rose to encircle them, singing a counter message of love and tolerance. 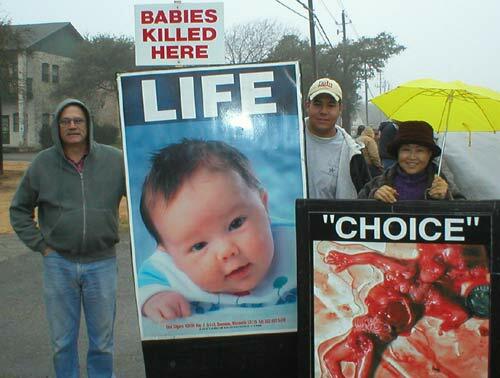 OSA protesters then covered the windows of the congregation’s day–care center with placards of disturbing images (click here to see a graphic example of Operation Save America placards). Young Adult members of the congregation responded by moving children into an interior room out of earshot of the protesters polemic language. Although the national OSA office disavowed the action of the individuals involved in disrupting First UU’s service, the post, “The Macedonian Call“, calling the disruption of the service at First UU “dynamic witness”, appears on the OSA website. Benham Group Disrupts ‘Synagogue Of Satan’ Unitarian Universalist Worship Services, Receives Proclamation From Mayor, on Right Wing Watch. Anti-abortion group harasses Unitarian church during moment of silence for dead member, on Rawstory.